Retail rivals Wal-Mart and Amazon are opening massive facilities just one freeway exit apart in Mobile County. Spring 2017, a tale of three cites. Two giants of retail, Amazon of Seattle and Wal-Mart of Bentonville, Arkansas, announce major site construction plans for Theodore — a key element of Mobile’s industrial base. 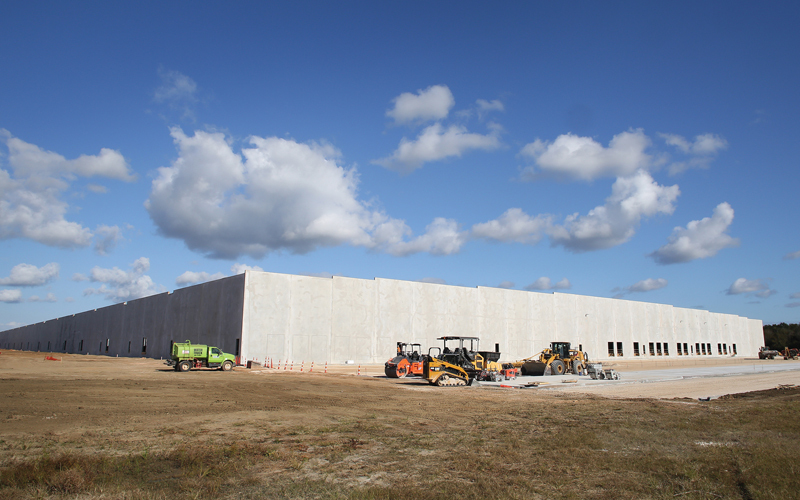 In March, 2017 Wal-Mart, with 11, 695 stores in 28 countries, reported its intent to open a distribution center in Mobile’s feeder community on West Interstate 10 in Theodore. The following June, Amazon announced similar plans. Choosing a location within 10 miles of the new Wal-Mart complex, Amazon brushed off claims that its announcement’s timing, physical proximity, and opening within a year of Wal-Mart’s were due to fierce competition between two juggernauts. But few deny each would like a bigger slice of the other’s pie. In addition to being a brick-and-mortar monolith that brought Sears to its knees, Wal-Mart maintains e-commerce websites in 11 countries. Amazon, a name identified more with e-commerce than nearly any other, is venturing into brick-and-mortar turf, such as physical book stores and acquiring the Whole Foods store chain. But Amazon spokespeople noted that comparing the two in Mobile definitely compares apples to oranges. The Wal-Mart Distribution Center will deliver products to regional centers, which in turn supply 800 stores throughout Alabama, Mississippi and areas to the north. The Amazon facility, which they dub a “sortation center, ” categorizes products sold on Amazon.com and consolidates shipments by region. It is projected to serve the coastal region, including parts of Florida through Louisiana. Amazon currently has 25 sortation centers in the U.S. Regardless of function, both have Mobile business and government leaders absolutely giddy. “Watching Amazon being built has been pretty phenomenal — a six-month start-to-finish turnaround, ” Wayman adds. Wayman adds, “Mobile fit Amazon’s logistics model. It is one reason why Mobile was chosen.” Other factors cited by Amazon and Wal-Mart were the city’s willingness and eagerness to work with their companies and Mobile’s location close to targeted markets. According to Mobile Area Chamber of Commerce figures, Amazon is projected to generate over the next 20 years some $127 million in salaries and $89 million in taxable sales and purchases here. ABOVE Wal-Mart’s $135 million distribution center will be the fourth largest of the retail giant’s distribution facilities. 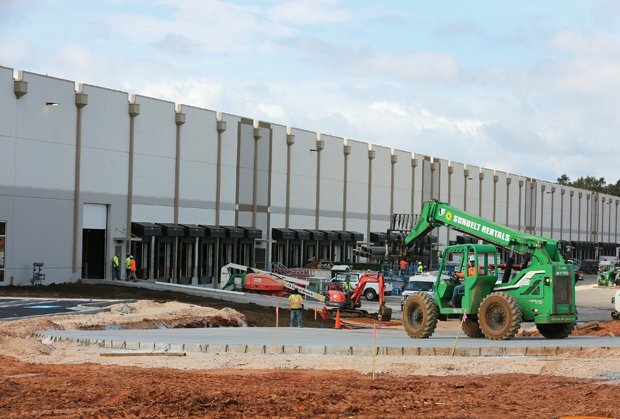 Construction of the Wal-Mart Distribution Center will take a bit longer, which is understandable, since they’re building a $135 million, 2.5 million-square-foot facility on 400 acres. “We are on pace and within our normal timeline for hiring, ” Wal-Mart spokesperson Phillip Keene says in a written statement. “We have some management in place already and our current plan is to have the majority of the initial leadership team on board by November – December, 2017.” Currently Wal-Mart expects to hire an additional 30 managers by year end, 2017. Keene added that hourly-wage employee hiring is expected to start in the January-February, 2018 timeframe. Fully operational, the Mobile Distribution Center is expected to increase local port traffic approximately 10 percent, according to a Wal-Mart press release. Wal-Mart expects to employ 550 full-time workers. The economic impact covering 20 years includes salaries totalling $568 million and taxable sales and purchases of $406 million. The distribution center is nine times the size of Mobile’s Airbus hangar. It will be Wal-Mart’s sixth super regional facility in the United States and the fourth largest. Emmett Burnett and Mike Kittrell are freelance contributors to Business Alabama. Burnett is based in Satsuma and Kittrell in Mobile.